We LOVE raw kale! It is great because any other salad with dressing would get all wilted when left with dressing in the fridge, where as kale just gets better, so this is a great leftover salad! The cooked onions and pears added so much goodness to this too. YUM! 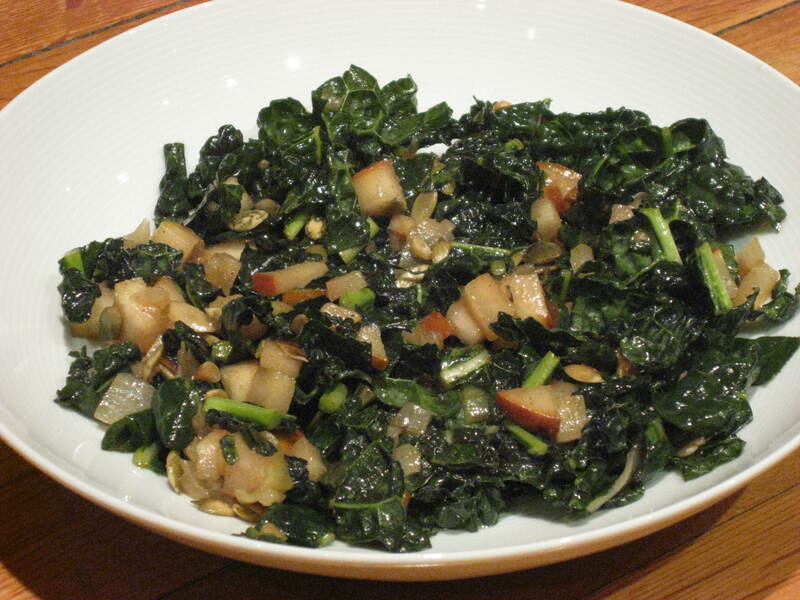 Place kale, garlic, and herbs into a large bowl. Sweat onion with 1 tablespoon olive oil for about 5 minutes or until translucent. Add agave and continue cooking until nicely caramelized, another 10-15 minutes. Carefully take cooked onions (place in the bowl with kale) out of the skillet, leaving some agave liquid in the pan. In the same pan, saute diced pear until tender but still firm (add a dash or two of cinnamon to the pears). Once cooked, add to the kale and mix through. To dress salad, add remaining 1-2 tablespoons of olive oil, vinegar, lemon juice, and salt and pepper, all to taste. Let the salad sit for about 30 minutes to 24 hours to tenderize the kale without having to cook it. The salad should be vinegary and delicious. thanks!! It was awesome!! let me know what you think 🙂 more kale salad recipes to come!!! This sounds great – so healthy and so tasty! exactly 🙂 best combo: healthy and tasty!!! thanks! This dish looks so tasty! Thanks for sharing! Thanks! It was 🙂 let me know if you try it. More kale recipes to come soon!